The Laboratory on Design Thinking in Education (dLab) will again join forces with the UK College of Education and AdvancED to deliver a pre-summit workshop on Wednesday, Novebmer 28, 2012 at the Lexington Convention Center. You may register for the summit now. More information will be published soon on how to register for the pre-summit workshop. The dLab is on Pinterest! Follow our posted images and follow us if you like. Click here to visit the page. The dLab launched its own Google+ page on August 9, 2012. Please put us in one of your circles! Click here to visit the page. 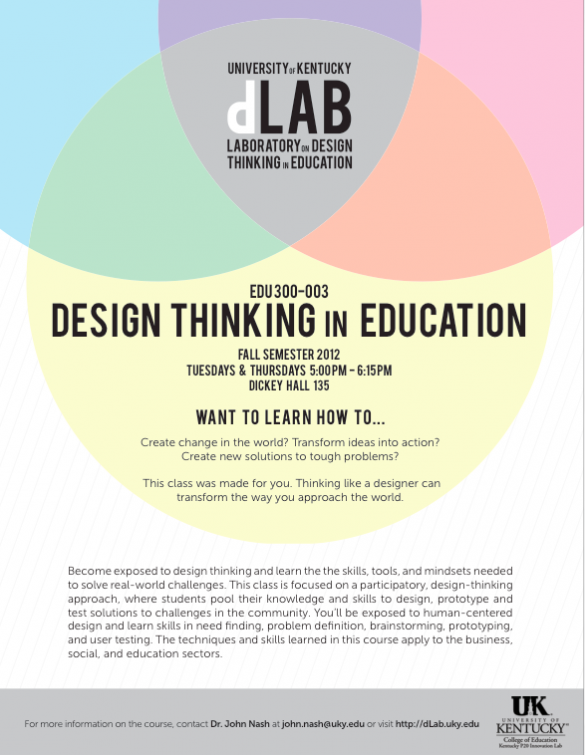 The course, “Design Thinking in Education” (EDU 300-003) will be offered in Fall 2012 in the College of Education at the University of Kentucky. This course exposes students to many facets of design thinking and provides them with an interdisciplinary perspective about the role of design in addressing the world’s challenges. EDU 300 also raises awareness about the value and power of design thinking our culture. EDU300, Design Thinking in Education is a course in which students work on challenges facing the P-20 community. The class is focused on a participatory, design thinking approach, with particular attention to the needs of clients in the education and social change space who offer real-life challenges for students to work on. Students from several majors with different experiences will pool their disparate yet complementary knowledge and skill sets to work to iteratively design, prototype and field test solutions to a challenge posed by a client group. Students will work in collaborative teams on semester-long projects in collaboration with client organizations, field liaisons, and a set of multidisciplinary experts. Students are exposed to the process of human-centered design, and hone their skills in need finding, problem definition, brainstorming, prototyping, and user testing. The course will consist of hands-on labs, guest speakers, and a guided design process. For more information contact John Nash at john.nash@uky.edu.